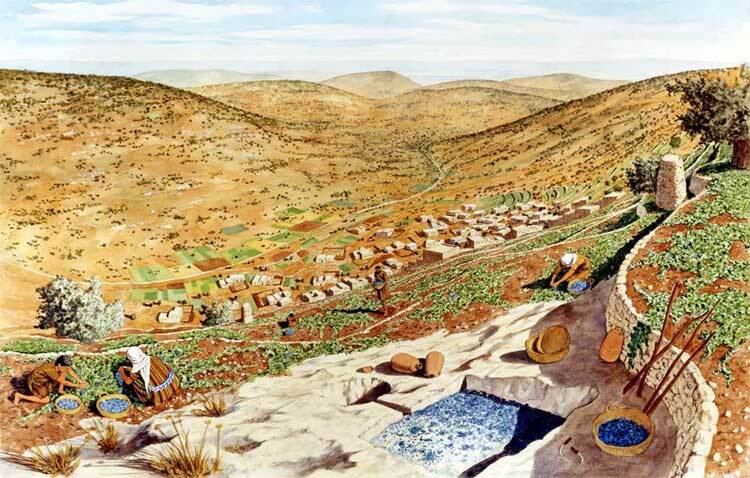 In ancient Israel, natural springs were limited in number and location. Consequently, cisterns (artificial reservoirs) were cut into bedrock for collecting rain runoff--this was perhaps the most common access to water. However, cisterns as well as other sources of water (rivers, etc) were most often contaminated and therefore not suitable for drinking. Consequently, wine was the commonly consumed beverage in the biblical world. The bible uses nine different names for wine--attesting to its wide use. The most common word is yayin--used over 140 times in the bible. The next most common word, appearing 38 times, is tiros which is sometimes translated "wine" but often translated "new wine"--meaning newly fermented wine "wine". Asis is used to refer to unfermented juice of the grape. Vineyards require several years before yielding grapes of high quality. Generally, only stable societies can successfully engage in viticulture. "Vine cultivation is done not from seeds but from plant cuttings and shoots, and grapevines were manipulated in several ways. The vines could be draped over a trellis, or trained to climb trees, or allowed to trail on the ground, or worked in a vineyard. To plant a vineyard was a sign of permanent settlement" (Philip J King and Lawrence E. Stager, Life in Biblical Israel , 98-99). 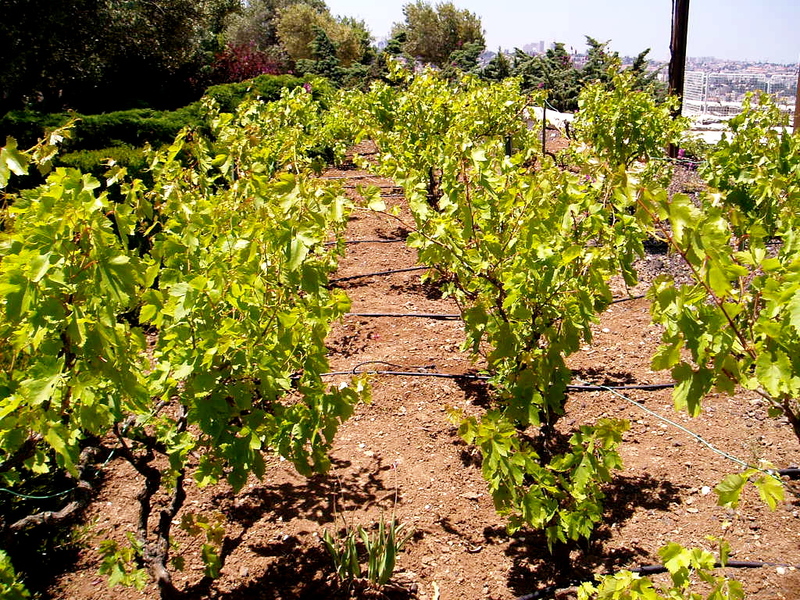 Thus biblical statements regarding vineyards can represent prosperity and permanence (e.g., Jeremiah 32:15; Ezekiel 28:26). 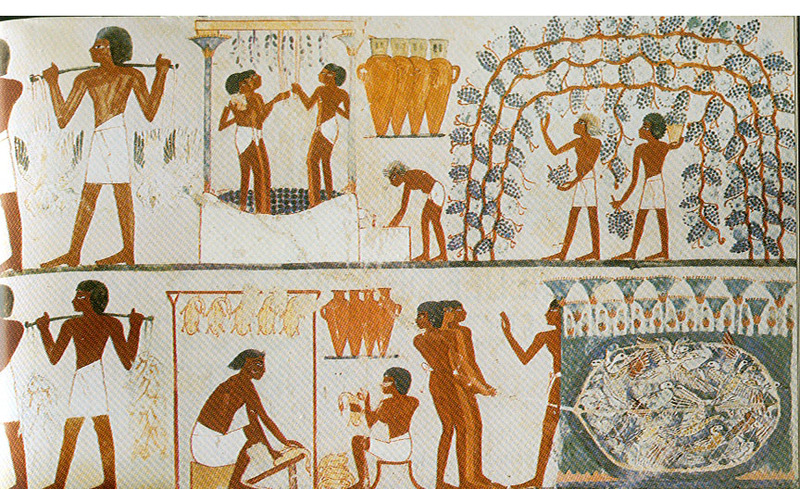 In the upper panel on the right of this tomb painting, the harvesting of grapes is depicted. Towards the middle of the upper panel, three men are shown treading the winepress while holding on to ropes hanging from the trellis. Just to the right of the winepress the juice of the treaded grapes empties into a collecting vat. Directly above are four earthen jars for storing the wine. "Harvesting was done by cutting clusters of grapes from the vine with pruning knives. Then the grapes were placed in baskets and carried o the winepress, ordinarily situated within the vineyard but sometimes in the city. Winepresses were hewn from bedrock to form a flat surface for treading. They consisted of a pair of square or circular vats (called gat and yeqeb in Hebrew) arranged at different levels and connected by a channel. 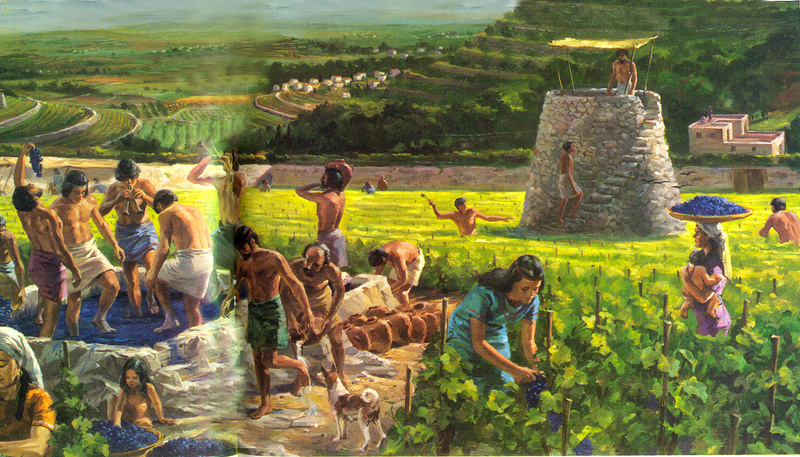 The grapes were trodden by bare feet in the treading platform (gat), which was higher and larger than the deeper yeqeb, the receptacle into which the new wine flowed from the press. . . . After the grapes were treaded, the expressed juice ran into vats carved in the bedrock or constructed and lined with plaster. The juice collected in these vats was then set in a cool place for fermentation" (Life in Biblical Israel, 100-101). 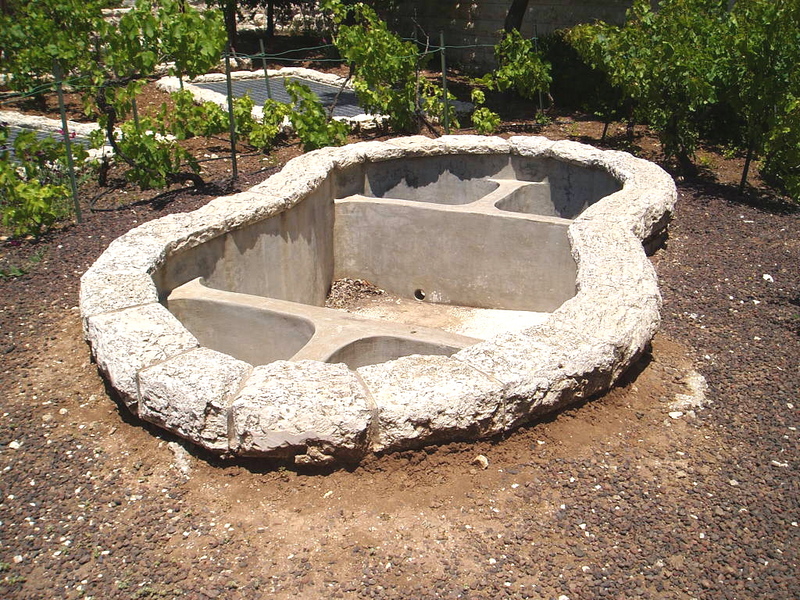 This is a functioning winepress located at Brigham Young University's Jerusalem Center for Near Eastern Studies. In the fall, students at the Center have an opportunity to tread grapes in this winepress. Students treading the grapes in the Jerusalem Center's winepress. This is a photo taken by one of my students of students treading the wine press. Winepress with hanging ropes for treaders to hold onto. Treading the wine vat was generally done by several people. However, Isaiah used the imagery of the Lord treading the wine vat alone in a gruesome way to demonstrate the anger of the Lord against the wicked upon his second coming. And the Lord shall be red in his apparel, and his garments like him that treadeth in the wine-vat. And so great shall be the glory of his presence that the sun shall hide his face in shame, and the moon shall withhold its light, and the stars shall be hurled from their places. Truly, it is the Lord's own prerogative to destroy the wicked. He alone has that right!